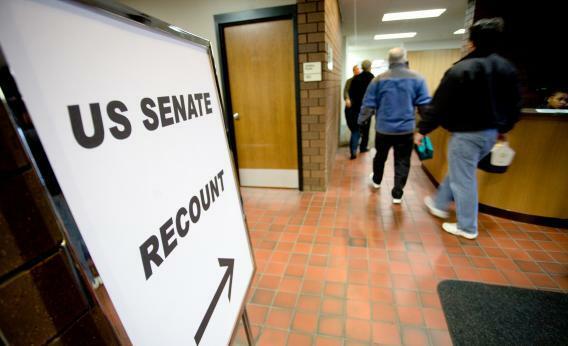 A North Dakota recount: why it could be the biggest election-law nightmare we've ever seen. The election recount room for the Senate race between Al Franken and Norm Coleman at the Ramsey County election office on November 19, 2008 in St. Paul, Minnesota. Let’s move on from last week’s vogue of electoral-college deadlock scenarios—which would throw the election of the president to the House and the vice president to the Senate—and toward what is shaping up as 2012’s post-election legal nightmare: a North Dakota recount. Both Democrats and Republicans are busy preparing to wake up Wednesday having to wage legal fights in both North Dakota and Montana, which share small electorates and very close Senate races. North Dakota has the prospect of being a much more open-ended mess if lawyers for candidates Rick Berg and Heidi Heitkamp start challenging the eligibility of those who cast ballots: The state is the only one with no voter registration. Any North Dakotan who arrives at a polling place (or early-vote location) with an ID card showing him or her to be over 18 years old and a resident of the local precinct is handed a ballot approved by a judge of elections. Anyone who does not have ID, or one with a local address on it—or is challenged by an election monitor—can complete an affidavit ballot attesting to his or her eligibility. While the state retains a central file of who has participated in past elections, voters’ IDs are not checked against it or any other external data source. But these affidavit ballots are not segregated, as provisional ballots are elsewhere. Like standard ballots, they are filled out by hand and then run through an optical scanner on the spot, according to Cass County auditor Mike Montplaisir, and counted immediately. Even though recounts are automatically triggered when a North Dakota election is determined by a margin of less than one-half of 1 percent—or within 2 percent if requested by the losing candidate—they have never in the past involved questions of individual eligibility. “It’s never got into challenging voters, because if a vote has been cast and a vote has been counted you can’t determine which votes have been cast which way,” says Montplaisir, who oversees elections in the state’s largest county. Imagine Heitkamp v. Berg having all of the legal machinations of the epic eight-month Minnesota recount that eventually sent Al Franken to the Senate, laced with the partisan vote-fraud paranoias that have hovered over this election cycle. This time, however, it is Democrats who are imagining buses of ineligible voters streaming to polling places, particularly arriviste oil-field workers in the booming northwest corner of the state who could cast affidavit ballots even if not they’re not permanent North Dakota residents.